How do Sound Barriers Work? 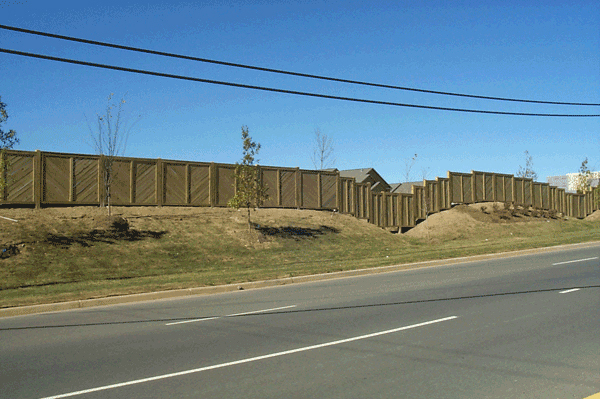 Sound barriers are walls or fences that are constructed by roadways to reduce the volume of traffic noise that reaches nearby residential or commercial areas. Many residential communities that are located next to busy roads or highways have sound barriers to improve the quality of life for the residents there. They work by physically reducing the amount of sound waves that reach the residential or commercial area from the roadway. While they don’t block all noise, they can cut “the loudness of traffic noise by as much as one half,” according to the Federal Highway Administration. “For example, a barrier which achieves a 10-dB reduction can reduce the sound level of a typical tractor trailer pass-by to that of an automobile. The average noise barrier reduces traffic noise from between 5-10 dB. The taller the noise barrier, the more noise. Every meter of height adds an additional 1.5 dB of attenuation. 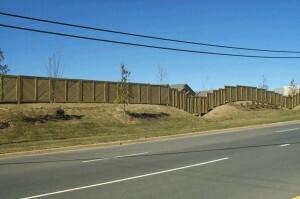 Seen below is a noise barrier installed by Hercules Fence of Richmond near a residential community. Note the fact that it is built on top of an already raised mound of earth, which contributes to the total height of the fence and improves its noise reducing capabilities. This entry was posted on Thursday, February 6th, 2014 at 10:33 pm. Both comments and pings are currently closed.